Red in color: Bed bug bites have an intense red spot located in the middle of the bite. Grouping arrangements: These bites tend to be in clusters of three, typically lined up one after the other. Clusters are not always linear and can also be bunched together in the same area. Bite locations: Bed bugs usually bite the face, neck, arms and hands. While they may bite elsewhere on the body, these four areas are most common. 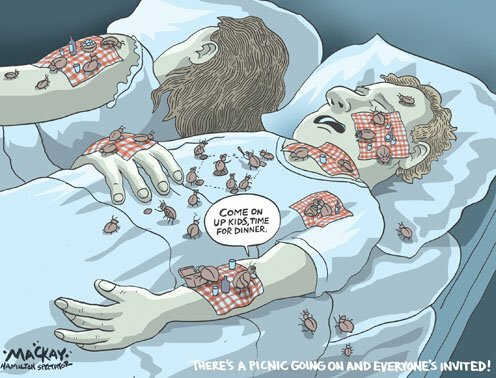 Timing: It may take up to a week for bed bug bites to appear and produce symptoms. Because of this time lag, bed bugs can spread when victims unknowingly bring them home from trips. Sequence: Bite symptoms begin with small bumps on the four main bite locations. They’re not itchy or painful to begin with, so the best way to diagnose is the linear pattern of bumps. After a few days, the red welts will rise and itching may occur.